Heavy gauge steel registers for heavy traffic areas. You will also find some larger, hard to find sizes. The satin anodized floor register has a unique look with its subtle, smooth, light silver shading. This register cover is corrosion resistant. These gym grade registers are offered in 100's of sizes and many different finishes. Suitable for floor, wall or ceiling use. 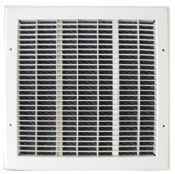 These vents are heavy duty and will stand up to high traffic.